Physical activity, strong emotion, eating, heavy clothing, medications, high room temperature, and high humidity can all increase body temperature. Fever is an important part of the body's defense against infection. Most bacteria and viruses that cause infections in people thrive best at 98.6 F. Many infants and children develop high fevers with mild viral illnesses. Although a fever signals that a battle might be going on in the body, the fever is fighting for, not against the person. 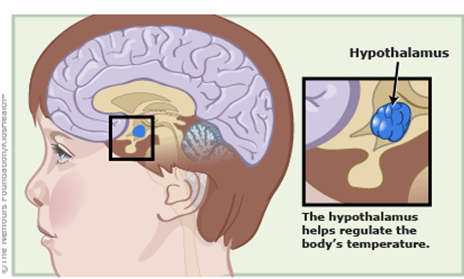 Brain damage from a fever generally will not occur unless the fever is over 107.6 (42). Untreated fevers caused by infection will seldom go over 105 unless the child is overdressed or trapped in a hot place. Teething may cause a slight increase in a child's temperature, but not higher than 100. Autoimmune or inflammatory disorders may also cause fevers. 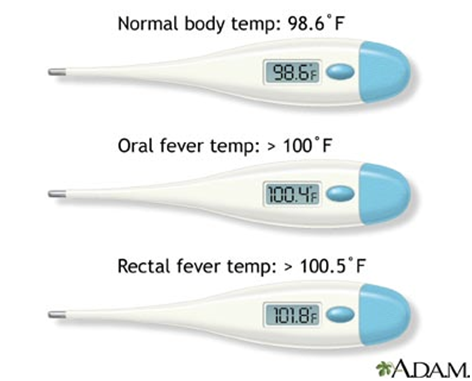 A simple cold or other viral infection can sometimes cause a high fever (102 - 104&#x2109;, or 38.9 - 40&#x2103;). This does not usually mean you or your child has a serious problem. 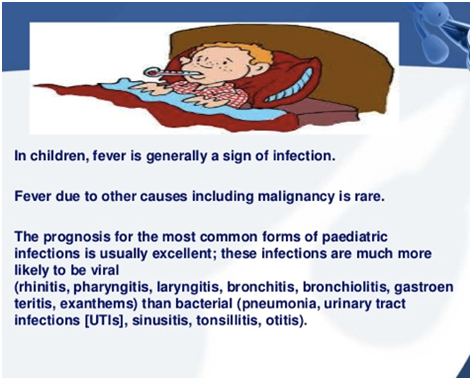 Some serious infections may not cause a fever, or may even cause a very low body temperature, especially in infants. 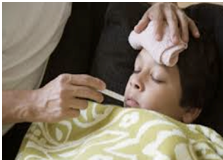 Acetaminophen and ibuprofen help reduce fever in children and adults. Sometimes doctors advise you to use both types of medicine. Know how much you or your child weighs, and then always check the instructions on the package to find the correct dose. In children 3 months or younger, call your doctor first before giving medicines. Do not give too much fruit juice or apple juice and avoid sports drinks in younger children. Your doctor will perform a physical examination. This may include a detailed examination of the skin, eyes, ears, nose, throat, neck, chest, and abdomen to look for the cause of the fever. "Do less, Stimulate less, Speak less, Eat less" "Drink more, Sleep more, Rest more, and Breathe more"
4) Turn the volume down. Reduce activity levels, noise, excitement, schedules, chores, and tasks to a minimum. Regardless, you should report any fever in a newborn that is higher than 100.4%u2109 (taken rectally) to the child's doctor. Do not give your child too much fruit or apple juice. Dilute these drinks by making them one half water, one half juice. 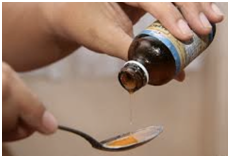 Acetaminophen and ibuprofen help lower fever in children. Your child's doctor may tell you to use both types of medicine. In children under 3 months of age, call your doctor first before giving them medicines. Do not give aspirin to children unless your child's doctor tells you it's OK.
3.Choose foods high in Good Fat such as olive oil, peanut oil, fatty fish, walnuts, flaxseeds. If you do not eat fish, talk to your doctor about taking fish supplements. 1.Cut down Sugary beverages and foods. Do not add any extra sugar to beverages. 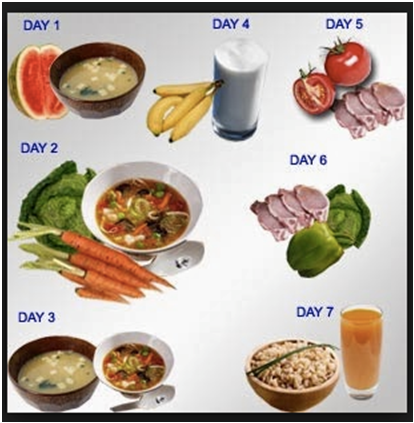 2.Refined ingredients like white rice, white flour, maida should be completely omitted from diets. 3.Avoid combination of sugary and refined foods like cakes, pies, ice creams as they do the most harm. 4.Avoid Unhealthy Fats such as Cholesterol, Saturated and Trans Fat. Stay away from egg yolks, cream, butter, ghee, coconut, deep fried items, whole milk, dalda, vanspati. 5.Slash down any intake of carbonated, caffeinated or alcoholic beverages.